What Treatments Do You Recommend for My Smile? Different dentists will have different ideas on how to achieve your best looking smile. Listen to what each has to say, keeping in mind that their treatment plans may not all be the same. Then, go with the dentist who makes you feel most comfortable and who is most willing to accommodate your needs. Can Your Recommendations Be Modified? Because there is more than one way to achieve your smile goals, there may also be several treatment options. Don’t be afraid to ask if there are alternatives that are more suited to your lifestyle or your wallet. What Kind of Training Does the Dentist Have? Many dentists have advanced training in the field of cosmetic dentistry. 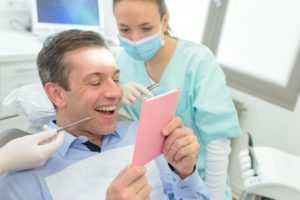 There are continuing education courses and several dental institutes across the country that offer classes to help dentists become more proficient in several specialties. Ask each dentist about their advanced training. Can I See Pictures of Other Patients? Cosmetic dentist are usually delighted to show you the before and after photos of some of their other patients. This way you can see just how much a smile a can change. After all, a picture speaks louder than words and this is possibly no more true than when it comes to a smile that goes from unsightly to dazzling. How Long Will My Smile Transformation Take? A good cosmetic dentist should be able to give you an idea of how long the entire cosmetic process will take. Of course, this depends on the number of treatments required. Once again, that depends on the treatments needed. For example, dental implants to replace missing teeth can last a lifetime with good oral hygiene care. Porcelain veneers usually last seven to ten years. If you’ve had your teeth whitened, then watching what you eat, not smoking and having touch ups will extend the life of your white smile. Are you ready to have the smile you’ve always dreamed of? Then contact a dentist in Wethersfield and schedule a consultation. Drs. Thomas and Brendan Dolan are a father-son team of dentists who take pride in providing the best of cosmetic dentistry for their patients. They’ll be glad to evaluate your smile and make recommendations for treatment. They currently practice at Dolan Dental, and they can be contacted through their website or by phone at (203) 427-0868 for any questions.